Frontières || Borders || Fronteras is a video-installation centering on our relationship with the cultural and media borders in North America. The images and sounds are drawn from Canadian, American and Mexican television. 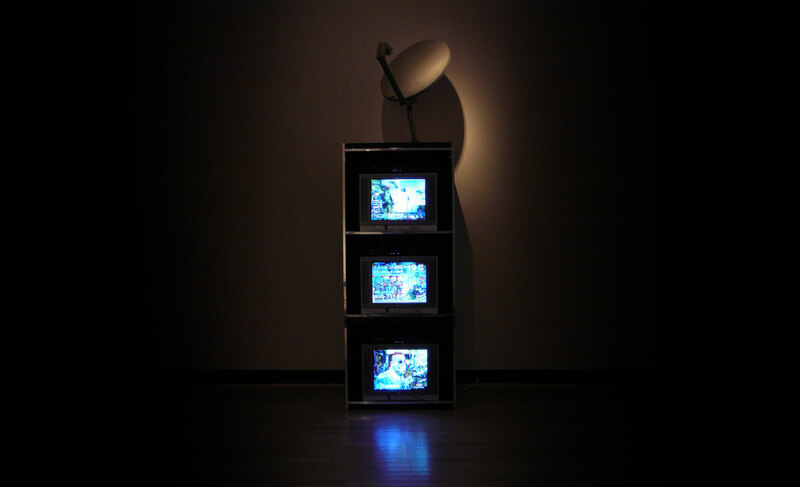 In line with the continent’s geopolitical configuration, three televisions are stacked on top of each other, forming a videographic triptych. While each screen has its own narrative, the overall montage is structured in relation to the other two, thereby alluding to Marshall McLuhen’s “global village.” Inspired by the concept of free trade of goods and services, Frontières || Borders || Fronteras distils a kaleidoscopic array of televisual material into a unified whole, based on the themes of social constraints, differences and borders. Frontières || Borders || Fronteras es una video instalación que aborda el tema de nuestra relación con las fronteras culturales y mediáticas en América del Norte. Las imágenes utilizadas provienen de la televisión canadiense, americana y mexicana. En relación con el espacio geopolítico del continente, tres televisores superpuestos uno sobre otro forman un tríptico videográfico. Estructurado en función de su relación audiovisual con los otros dos televisores, cada una de las pantallas tiene una narrativa propia, que al final forma un montaje global, haciendo evidentemente referencia a “la aldea global” de Mcluhan. The artist acknowledge the financial support of the Sherbrooke city.